Dexketoprofen is a non-steroidal anti-inflammatory drug. It is manufactured by Menarini, under the tradename Keral. It is available in the UK, as dexketoprofen trometamol, as a prescription-only drug and in Latin America as Enantyum, produced by Menarini. Also, in Italy and Spain it is available as an over-the-counter drug (OTC) under the tradename respectively Enantyum, Ketesgel. In Latvia, Lithuania and Estonia it is available as over-the-counter drug (OTC) under tradename Dolmen. In Mexico it is available in tablet form as "Stadium" made by Menarini. It is the dextrorotatory stereoisomer of ketoprofen. Short-term treatment of mild to moderate pain, including dysmenorrhoea. It may cause dizziness and so may affect the ability to drive. Dexketoprofen belongs to a class of medicines called non-steroidal anti-inflammatory drugs (NSAIDs). It works by blocking the action of a substance in the body called cyclo-oxygenase. 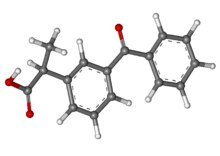 Cyclo-oxygenase is involved in the production of chemicals in the body called prostaglandins. Prostaglandins are produced in response to injury or certain diseases and would otherwise go on to cause swelling, inflammation and pain. By blocking cyclo-oxygenase, dexketoprofen prevents the production of prostaglandins and therefore reduces inflammation and pain. Along with Peripheral analgesic action it possesses central analgesic action. ↑ "Medicinal products authorised in Estonia". State Agency of Medicine. 22 May 2014. Retrieved 23 May 2014.